Transformation is the process by which foreign DNA is introduced into a cell. Transformation of bacteria with plasmids is important not only for studies in bacteria but also because bacteria are used as the means for both storing and replicating plasmids. Because of this, nearly all plasmids (even those designed for mammalian cell expression) carry both a bacterial origin of replication and an antibiotic resistance gene for use as a selectable marker in bacteria. Many companies sell competent cells, which come frozen and are prepared for optimal transformation efficiencies upon thawing. For the highest transformation efficiency, we recommend that you follow the instructions that came with your competent cells. *Pro-Tip* Commercial competent cells range significantly in their transformation efficiency. The lowest efficiency cells (usually the least expensive) are fine for transforming plasmid DNA for the purposes of storage and amplification. Higher efficiency cells are more important if you will be transforming with very small amounts of DNA or if you're multiple plasmids at once. *Pro-Tip* To save money, many labs also make their own competent cells. This is a relatively simple procedure and is useful for performing low efficiency transformations. Take competent cells out of -80°C and thaw on ice (approximately 20-30 mins). Remove agar plates (containing the appropriate antibiotic) from storage at 4°C and let warm up to room temperature and then (optional) incubate in 37°C incubator. Mix 1 - 5 μl of DNA (usually 10 pg - 100 ng) into 20-50 μL of competent cells in a microcentrifuge or falcon tube. GENTLY mix by flicking the bottom of the tube with your finger a few times. *Pro-Tip* Transformation efficiencies will be approximately 10-fold lower for ligation of inserts to vectors than for an intact control plasmid. Incubate the competent cell/DNA mixture on ice for 20-30 mins. Heat shock each transformation tube by placing the bottom 1/2 to 2/3 of the tube into a 42°C water bath for 30-60 secs (45 secs is usually ideal, but this varies depending on the competent cells you are using). Put the tubes back on ice for 2 min. Add 250-1,000 μl LB or SOC media (without antibiotic) to the bacteria and grow in 37°C shaking incubator for 45 min. *Pro-Tip* This outgrowth step allows the bacteria time to generate the antibiotic resistance proteins encoded in the plasmid backbone so that they will be able to grow once plated on the antibiotic containing agar plate. This step is not critical for Ampicillin resistance but is much more important for other antibiotic resistances. Plate some or all of the transformation onto a 10 cm LB agar plate containing the appropriate antibiotic. *Pro-Tip* We recommend that you plate 50 μL on one plate and the rest on a second plate. This gives the best chance of getting single colonies, while allowing you to recover all transformants. *Pro-Tip* If the culture volume is too big, gently collect the cells by centrifugation and resuspend in a smaller volume of LB so that there isn't too much liquid media on the agar plates. If the agar plate doesn't dry adequately before the cells begin dividing, the bacteria diffuse through the liquid and won't grow in colonies. Incubate plates at 37°C overnight. How can I save time when carrying out transformations? If you are not concerned with transformation efficiency (such as when you have a tube of plasmid DNA and just need to transform bacteria so that you can grow up more of the plasmid) you can save a lot of time by shortening or skipping many steps and will still get enough colonies for your next step. Remember that each of these shortcuts will reduce the efficiency of the transformation, so when higher efficiency is needed follow the complete protocol. I get very few if any transformants when transforming large plasmids (>10 kb) or BACs, what can I do? Chemically competent cells are fast and easy to use, but are less efficient at taking up larger plasmids. If you need to transform large plasmids, it is a good idea to use electro-competent cells. Instead of relying on the heat-shock to cause the cells to take up the DNA, an electro-magnetic field is applied to the cell/DNA mixture to induce membrane permeability. To do this you will need to have access to an electroporator and the appropriate cuvettes. Follow the manufacturer's instructions for each. I got no transformants. What went wrong? Check that you are plating on an LB Agar plate containing the correct antibiotic. 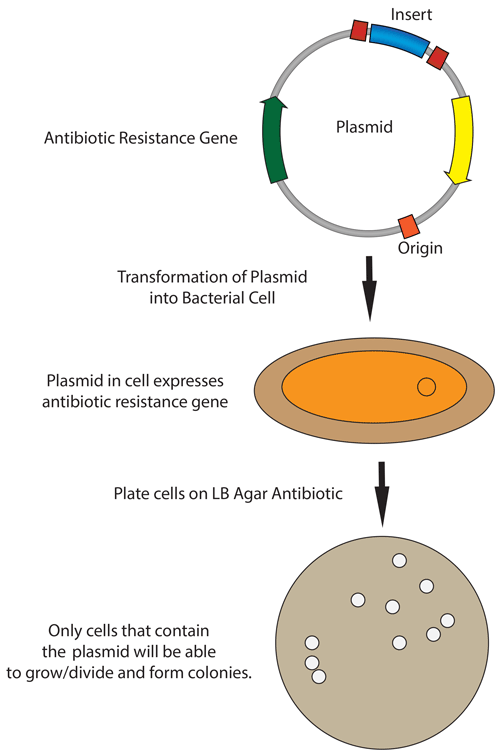 The resistance gene on your plasmid must match the antibiotic on the plate. You should also add a positive control (many companies include a positive control plasmid with their competent cells) to ensure that your transformation procedure is working. TIP: Sometimes less is more. Although it may be counter-intuitive, you will often get higher transformation efficiencies with less DNA, especially when using highly competent cells. If you used 100-1000 ng of total DNA in a ligation you will often get more colonies if you use 1 μl of a 1:5 or 1:10 dilution rather than 1 μl directly.